Lucky Scooters team pro riders, Capron and Corey Funk take the cake as some of the gnarliest siblings in the sport of scootering! They are constantly progressing, expanding their trick lists and taking their tricks to bigger and bigger obstacles. 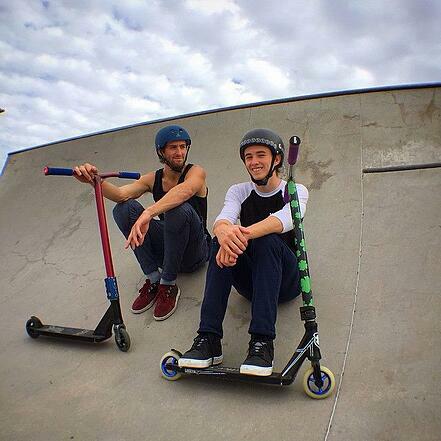 With that said, it is pretty common for these two guys to ride together, film together, and push each other to new heights, which is exactly what they did on one of their more recent trips to Woodward West. They even have a sweet video to showcase all of the mayhem that went down, entitled “Woodward Session”! For those of you who haven’t seen the video, sit back, relax, and enjoy the pure anarchy of the Funk brothers. This video is the perfect showcasing of 2 entirely unique riding styles coming together to make one awesome edit. Capron delivers as always, with his extremely technical wizardry, while Corey brings his huge, big air tricks to the table. Definitely give this video a watch if you haven’t seen it yet, and be prepared to rewind several times through out the course of the video.